We have the first report of a real Tesla autopilot crash. To be fair to Tesla, their owner warnings specify very clearly that the autopilot could crash in just this situation. In the video, there is a stalled car partly in the lane and the car in front swerves around, revealing little time for the driver, or the autopilot, to react. The deeper issue is the way that the improving quality of the Tesla Autopilot and systems like it are lulling drivers into a false sense of security. I have heard reports of people who now are trusting the Tesla system enough to work while being driven, and indeed, most people will get away with this. And as people get away with it more and more, we will see people driving like this driver, not really prepared to react. This is one of the reasons Google decided not to make a system which requires driver takeover ever. As the system gets better, does it get more dangerous? Last month, various EU officials gathered in Amsterdam and signed the Declaration of Amsterdam that outlines a plan for normalizing EU laws around self-driving cars. 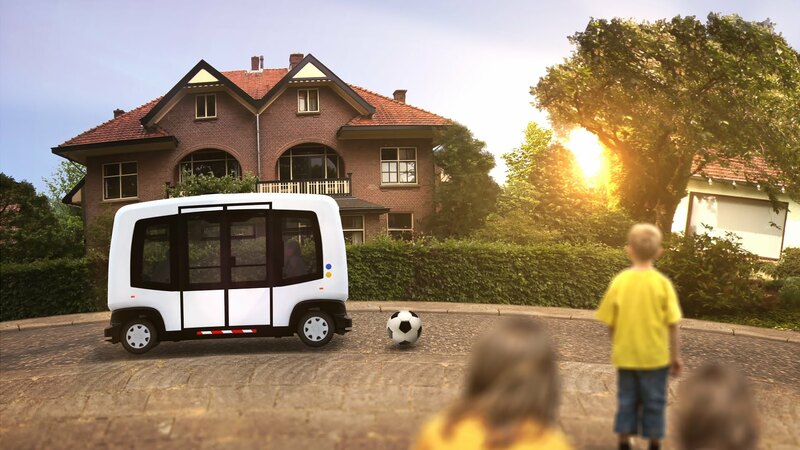 The meeting included a truck automation demo in the Netherlands and a self-drive transit shuttle demonstration. It’s a fairly bland document, more an expression of the times, and it sadly spends a lot of time on the red herring of “connected” vehicles and V2V/V2I, which governments seem to love, and self-driving car developers care very little about. It was a sign of the times when her Majesty the Queen, giving the speech from the throne in the UK parliament, laid out elements of self-driving car plans. The Queen drove jeeps during her military days, and so routinely drives herself at her country estates, otherwise she would be among the set of people most use to never driving. The UK has 4 pilot projects in planning. Milton Keynes is underway, and later this year, a variation of the Ultra PRT pods in use at T5 of Heathrow airport — they run on private tracks to the car park — will go out on the open road in Greenwich. They are already signing up people for rides. In deciding which car companies are going to survive the transition to robocars, one thing I look for is willingness to stop thinking like a traditional car company which makes cars and sells them to customers. Most car company CEOs have said they don’t plan to keep thinking that way, but what they do is more important than what they say. In the past we’ve seen Daimler say it will use their Car2Go service (with the name Car2Come probably likely to cause giggles in the USA) as a way to sell rides rather than cars. BMW has said the same about DriveNow. (And now GM has said this about its partnership with Lyft.) Daimler is also promoting their moovel app which tries to combine different forms of mobility, and BMW is re-launching DriveNow in Seattle as ReachNow which adds peer-to-peer carsharing and other modes of transportation to the mix. Of course, these are tiny efforts for these big companies, but it scores big over companies still thinking only in the old ways. I’m looking at you, most car companies. BWM also announced the iNext electric flagship sedan will offer self-drive in 2021. In 2010, I put out a call for urban planners to starting thinking about robocars and mostly it fell on deaf ears. Times are changing and this month Florida told its cities they should include consideration of this and other future transit in their updated long-term plans. It is a tough call. Nobody’s predictions about the future here are good enough to make a firm plan and commit billions of dollars. At the same time, we are starting to learn that certain plans — especially status quo plans — are almost certainly seriously wrong. We may not have a perfect idea on what to spend city money on, but we can start to learn what not to do. Fortunately, transportation is becoming a digital technology, which means you can change your plans much faster than physical infrastructure plans. Robocars like bare pavement, as stupid as can be. The ‘smarts’ go in the cars, not in the roads or the cities. So if you change your mind, you just have to reprogram your cars, not rebuild your city. Which is good, because you can’t rebuild your city. China is the world’s number one car manufacturing company. A lot of people don’t know that. Last year I visited the Shanghai auto show and it was a strange trip to walk through giant hall after giant hall of automakers you have never heard of before. Self-driving car action in China has been slow. Right now everybody has a focus on just making regular cars for the rising middle class that is buying them as fast as they can. Wealthier Chinese usually buy foreign brands, although those cars are often made in China even though they have a VW or Buick nameplate. Baidu has been working on cars for a couple of years and promises a pilot project in 2018. Recently, Chinese automaker Changan did an autopilot demo driving 1,000 miles. China has had its own annual academic version of the Darpa Grand Challenge for several years as well. There is a strong chance that companies like Uber, Apple or Google, when they want to get their cars made, could go to Chinese manufacturers. Now that they’re getting practice at making their own technology. China is also a major source of electric vehicles, with future robotaxis likely to be small and electric. The manufacturers and suppliers with the most experience at making such vehicles are likely to be the winners. Speaking of which, Apple just put a billion dollar investment into Didi. You may not know Didi, but it is the dominant phone-hail service in China with a much larger market share than Uber. It’s one of the few places Uber has lost in the market, but of course it’s China. As the auto industry moves to being about selling rides rather than cars, it’s an interesting move by Apple, which rarely does outside investments like this.